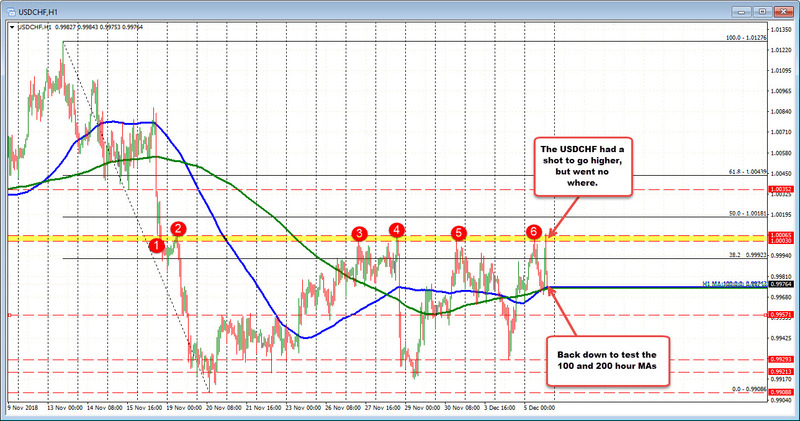 The USDCHF moved to the highest level since November 16th today. It was the second run toward the high today. The first stalled just ahead of the highest swing high since November 16 at 1.0006. The 2nd one reached 1.00078. When you take out a ceiling area, traders expect more to come. There wasn't any more. The price has moved back lower. The move has moved down to test the 100 and 200 hour MA (blue and green lines). The price has stalled at least for now. Like at the high, the 100 and 200 hour MAs represent a risk defining level. Given the ups and downs, the price could base and run back higher. It might give way and move lower. It's a coin flip but risk is defined and limited at least. If you like the dollar, buy here. If you don't like the dollar, sell on a break (or if short already from above, look for that break and more of a run lower).